Low-level epidural electrical stimulation with intensive locomotive treadmill training helped two patients regain the ability to walk over ground and two others to stand several years after paralysis due to severe spinal cord injuries. By combining low-level epidural electrical stimulation with intensive locomotive treadmill training, researchers have helped two patients regain the ability to walk over ground and two others to stand several years after paralysis due to severe spinal cord injuries. Building on earlier findings reported in 2011 and 2014, investigators at the Frazier Rehabilitation Institute and the University of Louisville's Kentucky Spinal Cord Injury Research Center tested intense body weight-supported treadmill training (BWSTT) combined with spinal stimulation 2.5 to 3.3 years after traumatic, complete spinal cord injury. Two individuals who regained the ability to walk over ground using a walker retained some sensation below their injury site, while the other two were able to stand using a walker and regained some trunk stability during stimulation. Of the two patients who were able to walk again, one had a C5 spinal cord injury and partially retained sensation to light touch, but not pinprick, while the second had a T1 injury, with partial retained sensation to light touch and pinprick. The two other patients, with T4 injuries and no movement or sensation below the abdomen, regained some trunk stability and were able to sit and stand without assistance. None of the subjects had voluntary sphincter control. The findings, reported September 27 in a brief report published in the New England Journal of Medicine, showed that standing and voluntary movement only occurred with each subject's intention to move during stimulation. “This suggests that broad segmental and suprasegmental excitation of spinal networks is entrained for walking after cord injury,” according to lead investigator Claudia A. Angeli, PhD, senior researcher at the Human Locomotion Research Center at the Frazier Rehab and Neuroscience Center and the Kentucky Spinal Cord Injury Research Center, both in Louisville. “When provided with the appropriate information, the spinal cord has the capacity to relearn the task of walking, even years after an injury that caused complete paralysis of the legs,” Dr. Angeli told Neurology Today. She added that, to date, the team has implanted stimulators in 13 individuals, including eight who have received some step training and, to some degree, all of them have shown some gains. “Significantly, the complex, coordinated, and sequential activation of motor neurons, as reflected in rhythmic electromyography activity in leg muscles, was appropriate for the step cycle and not entrained to the frequency of stimulation, which indicates that ensembles of neurons in the cord were activated,” Dr. Angeli said. Susan Harkema, PhD, associate scientific director at the research institute and director of research at the Frazier lab was co-primary investigator, and the research team also included investigators in the Department of Neurosurgery at the University of Louisville School of Medicine. Epidural stimulation involves delivering electrical current at different frequencies and intensities to locations on the spinal cord corresponding to neural networks largely responsible for movement of the hips, knees, ankles and toes. Body weight-supported treadmill training attempts to retrain the spinal cord to “remember” walking by repetitive standing and stepping while the patient is supported in a harness and their legs are moved to simulate walking. The investigators used the American Spinal Injury Association Impairment Scale (AIS) to classify injuries, with motor complete injury (AIS Grade A) Injury,” and patents pending for defined as loss of all sensory and motor function below the level of injury, and sensory incomplete injury (AIS Grade B) — the loss of motor function, but some spared sensation below the injury. The researchers used a 16-electrode array, implanted epidurally over spinal segments L1 to S1-S2, attached to a spinal cord stimulator surgically implanted in the anterior abdominal wall. Prior to undergoing surgery, each patient underwent intense BWSTT for two hours daily for five days over eight or nine weeks. One patient with Grade B damage to the mid-cervical region — sensory function, but not motor function, is preserved below the neurological level (including the sacral segments S4-S5) — achieved the ability to walk after 278 combined sessions over a period of 85 weeks. The other subject with Grade B damage to the high-thoracic region, could walk after 81 sessions over 15 weeks. In the two AIS Grade A participants — those with complete SCI, no sensory or motor function — one achieved the ability to stand after 176 sessions over 62 weeks, while the other could produce continuous steps on a treadmill after 40 sessions over 16 weeks, and could stand with a walker after 159 sessions over 41 weeks. “The ability to walk only occurred during combined epidural stimulation and the participant's intention to walk, suggesting activation of interneuronal networks in the lumbosacral spinal cord,” said Dr. Angeli. Bruce Dobkin, MD, FAAN, professor of neurology and director of the Neurologic Rehabilitation and Research Program at the University of California, Los Angeles David Geffen School of Medicine, cautioned that body weight-supported treadmill training is not without risk and may benefit only those individuals with less severe AIS injuries. “The techniques are potentially useful in conjunction with a biological repair intervention at the site of injury of an AIS subject, but adds to the surgical risk of infection from the implanted stimulator and the potential for a leg bone fracture during training of chronically impaired persons,” he said, noting that one of the subjects suffered a fractured hip during the first week but underwent training one year later. “In prior studies during BWSTT, fractures of the femur and tibia have also been reported. Christopher Reeve suffered a fracture of the mid-femur that was complicated by bleeding that required transfusions,” Dr. Dobkin said. “Bone demineralization is common in chronically paralyzed individuals, and this complex and not risk-free intervention ought to be reserved for those patients graded AIS B if further testing of its efficacy and risk-cost-benefit ratio is planned,” he told Neurology Today. Because two participants with AIS A scores did not regain the ability to walk, “one has to ask if this will be a worthwhile goal, expense, and risk-benefit for future AIS A subjects,” he said. According to Dr. Angeli, however, few Grade A paralysis patients have complete transections of the spinal cord; most have some capacity for sensation, she said. Anna Marie Barrett, MD, FAAN, director of the Stroke Rehabilitation Service at Kessler Foundation, in West Orange, NJ, said that in discussing the study with patients it is important to emphasize that the results were not a return to normal function. Currently, patients would only be able to have access to the technique through clinical trials, she noted. If the research can be replicated, Dr. Barrett said that she hopes to start seeing studies that look at how stimulation is affecting activity and participation for patients, for example the ability to access more environments may mean a return to work. •. Angeli CA, Boakye M, Harkema S, et al Brief Report: Recovery of over-ground walking after chronic motor complete spinal cord injury https://www.nejm.org/doi/full/10.1056/NEJMoa1803588. New Engl J Med 2018; 379:1244–1250. •. Angeli CA, Edgerton VR, Gerasimenko YP, Harkema S. Altering spinal cord excitability enables voluntary movements after chronic complete paralysis in humans https://academic.oup.com/brain/article/137/5/1394/333047. Brain 2014;137:1394–1409. •. Harkema S, Gerasimenko Y, Hodes J, et al Effect of epidural stimulation of the lumbosacral spinal cord on voluntary movement, standing, and assisted stepping after motor complete paraplegia: a case study https://www.thelancet.com/journals/lancet/article/PIIS0140-6736(11)60547-3/fulltext. Lancet 2011;377(9781):1938–1947. 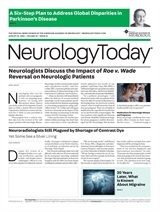 Neurology Today18(21):10-11, November 1, 2018.